In recent months, Symantec have seen a major uptick in formjacking attacks against high-profile websites across the globe. From their telemetry, Symantec has also observed locally popular websites (those with an Alexa Rank of less than 5,000 in a particular country) in the U.S., Japan, Germany, and Australia, among other countries, being injected with formjacking scripts. Symantec’s Intrusion Prevention System (IPS) technology proactively protects website users from formjacking attacks. In the past three months alone, IPS has blocked more than 1 million formjacking attempts on more than 10,000 unique websites. Taking into account supply chain attacks, which can allow attackers to gain access to large companies by exploiting weaknesses in smaller businesses used by the larger company to provide different services, we can easily say that the actual number of infected websites is bound to be higher. Recently, Symantec came across a website of a retail store in Paris which was injected with a formjacking script (Figure 1). The code shown in Figure 1 collects the payment information entered by users on the website and posts it to the domain google-analyitics.org. This domain is a typo-squatted version of the legitimate Google Analytics domain, google-analytics.com. This was no new occurrence, considering the number of payment information-stealing script injections Symantec sees daily. However, digging into our telemetry, we came across an interesting pattern. We observed popular websites from different countries—such as the U.S., Japan, Australia, and Germany—redirecting to this one Paris website. This created an interesting redirection chain as customers of all these websites were being infected by formjacking at the same time. Figure 2 shows how this infection chain works. This attack chain is unique in the sense that it differs from the prevalent supply chain formjacking attack, where attackers compromise popular third-party script library providers. As these scripts are loaded by many websites, with one compromise the attacker manages to load their malicious code on a large number of websites all at the same time. 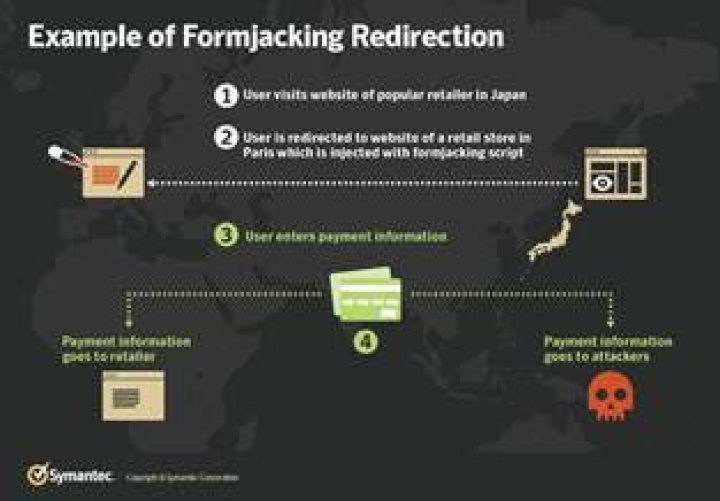 In our scenario, the redirecting website and the compromised website in many cases come from different areas of the online shopping landscape, dealing in entirely different product spaces. Victims may not realise they are victims of formjacking, as generally their websites continue to operate as normal, and attackers are sophisticated and stealthy and take steps to avoid detection. Symantec customers are protected from formjacking attacks.